The only wheat flour we use at fatisourfriend is processed from spelt or einkorn, both much older and unadulterated versions of wheat. Einkorn is best for our purposes as it appears to be better tolerated (and digested) by a wider group of people, still containing gluten but a different variety from that found in today's industrial wheat. Einkorn is a nutritious wheat with a high protein content when compared to modern forms of wheat. It also contains more phosphorous and carotenoids which are considered to have positive medical properties. The ground flour contains a different kind of gluten compared with modern wheat and does not contain the D Genome (used in gluten tests), only the A genome. A favourite of ours, we use this in sauces and mixed with almond flour in pastries. It doesn't give you such a fine roux as wheat flour does but it has many fewer net carbs and absorbs a greater quantity of oils and liquids. Just be careful not to burn it when you cook with it. Surprisingly, as soon as you add flavourings such as cheese or onions, the mild taste and smell of the coconut just fades away. 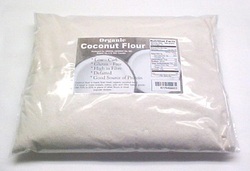 Coconut flour has a few more carbs than almond flour but contains no Omega-6 fatty acids. It is of course gluten free. Spelt is also an earlier form of wheat and has been cultivated for thousands of years in southern Italy. It is also known as dinkel wheat and is a hybrid of emmer wheat and bread wheat (as it used to be). This form of wheat has a harder outer shell before milling and has a nutty, slightly sweet flavor, similar to that of whole wheat flour but containing slightly less gluten. Known as the best friend of the LCHF pastry cook because it contains few carbs and no gluten, almond flour is also good for your health. Almonds have a low glycaemic index, are high in protein and very low in sugars. The argument against using too much almond flour also goes against most nuts. Almost all nuts and seeds are high in omega 6 fatty acids (excepting coconut, macadamia and walnuts), so you might want to balance your nuts with plenty of omega 3 rich seafood (if you'll pardon the expression). As stated; almond flour is gluten free. Other alternatives? There are other useful alternatives in the gluten-free corner such as chestnut flour and buckwheat but they tend to be higher in carbohydrate levels and we use them only in small quantities.